So, how much do you think you know about Gene Kelly? I’ve created a round of trivia for you; hopefully it’s not too difficult. Obviously, the answers are right there, so this is just for fun. I tried to find some clever way of doing a spoiler tag to hide the answers, but apparently WordPress is not on the ball with that particular feature. At any rate, I hope that you find these questions entertaining and edifying! Enjoy! Answer: C. Kelly graduated in 1933 with a BA in Economics. 2. Kelly starred with Judy Garland in three films. In which of these movies did Kelly and Garland NOT star? Answer: A. Kelly was originally set to star in Easter Parade alongside Garland, but he broke his leg before filming began. Fred Astaire came out of retirement to replace him. 3. Gene Kelly got his trademark scar when a dancing partner accidentally kicked him in the face. True or False? Answer: False. I have actually (I think?) read two different explanations for his scar. One is that he had a bicycle accident as a child, and the other, I believe, involved a fall from a fence he was climbing, also as a child. Either way, no kicks to the face. 4. With which leading lady did Kelly star most often? 5. What movie was originally conceived as a sequel to On the Town? Answer: C. On the Town is about three sailors on shore leave in NYC. It starred Kelly, Frank Sinatra, and Jules Munshin. It’s Always Fair Weather would catch up with the three men after 10 years of civilian life. Sinatra was unavailable, and so two different actors were cast opposite Kelly, but you can easily see how Sinatra and Munshin would have fit into the roles (and maybe have been better in them). 6. In how many films did Kelly portray a service member? Answer: D. Kelly himself enlisted in the US Navy in 1944, and appeared in many movies as either active military or ex-military; most notably, perhaps, in On the Town. 7. Kelly won an Oscar for Best Director for An American in Paris. True or False? Answer: False. Vincente Minelli directed An American in Paris, for which he was nominated for Best Director. Kelly did direct many of his own films and others, but was never nominated for an Oscar as a director. 8. Kelly was famous for his inventive and innovative dance sequences. Which of these did he not experiment with? Answer: A. To the best of my knowledge, Kelly never attempted breakdancing. He did, however, dance with Jerry the Mouse in Anchors Aweigh, with himself in Cover Girl, and on roller skates in both It’s Always Fair Weather and Xanadu. 9. Kelly and long-time collaborator Stanley Donen were both married to actress and dancer Jeanne Coyne. True or false? Answer: True. Coyne was briefly married to Donen from 1948 to 1951, when they divorced. She married Kelly, with whom she had two children, in 1960. They were together until her death in 1973. Incidentally, you can check out Coyne’s own footwork in Kiss Me, Kate. She’s dancing with Bobby Van in the “From this moment on” number. 10. Kelly’s first starring role on Broadway was in this musical; for a variety of reasons, however, he was never to star in a big-screen adaptation. Answer: C. With the exception of Kiss Me, Kate, Gene Kelly was at least briefly considered for roles in Guys and Dolls and a film version of Chicago, but Pal Joey is what brought him to Hollywood in the first place. Sadly, by the time the film was set to be made by Columbia Pictures, Kelly was under contract with MGM and therefore unavailable. Instead, Frank Sinatra starred in the 1957 film version. Did you learn anything? Check back tomorrow, when we’ll take a look at some of Kelly’s best routines! This entry was posted in Favorites, Featured Actors, Just for Fun. Bookmark the permalink. 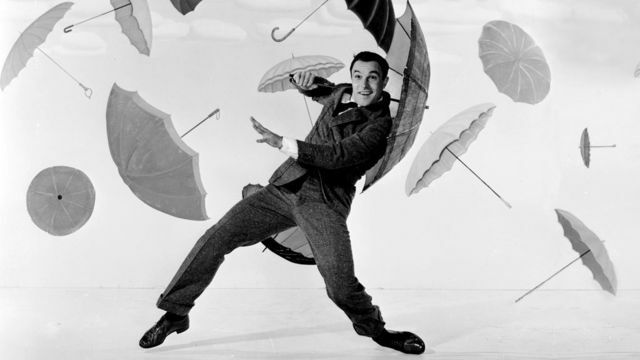 I love Gene Kelly and loved this Gene Kelly trivia quiz!